Historically conventional power plants have been built or bought based on relatively simple scenario analysis. But changing conventional plant value dynamics have meant this approach has become largely obsolete. Instead plant value analysis is evolving to better address market uncertainty, margin variability and the value of plant flexibility. But an increase in sophistication does not need to come at the cost of transparency. The value of European gas and coal fired power plants is a very different proposition to what it was 5 years ago. Growth in renewable output has eroded plant load factors and increased margin variability. Correspondingly, there has been a significant increase in the proportion of value driven by plant flexibility to respond to changes in market conditions. Historically, conventional power plants have been built or bought based on relatively simple scenario analysis. Plant value has been assessed against Base, High and Low price forecasts to give an indication of the potential range of value outcomes. But changing conventional plant value dynamics have meant this approach has become largely obsolete. Instead plant value analysis is evolving to better address market uncertainty, margin variability and the value of plant flexibility. Defining the key drivers of plant value and risk over different time horizons is key to this evolution. This means applying more sophisticated analytical methodologies, in contrast to the more one dimensional scenario focus that has traditionally been applied. But an increase in sophistication does not need to come at the cost of transparency. Prompt dispatch: the short term horizon (e.g. < 1 week) over which the plant is optimised in the prompt forward and balancing markets, as price certainty and granularity increases (e.g. with clearer information on weather, load and availability). Forward curve: the medium term horizon (e.g. 1-2 years) over which forward curve liquidity is available to facilitate hedging of plant generation margin. Lifetime value: the plant lifetime horizon (e.g. 10-20 years) which drives asset investment decisions (e.g. asset development, sale/purchase, major capex spend). Plant technical constraints: These are the physical characteristics of the plant that impact its ability to capture market value, e.g. ramp rates, efficiency curves, minimum down times and start costs. 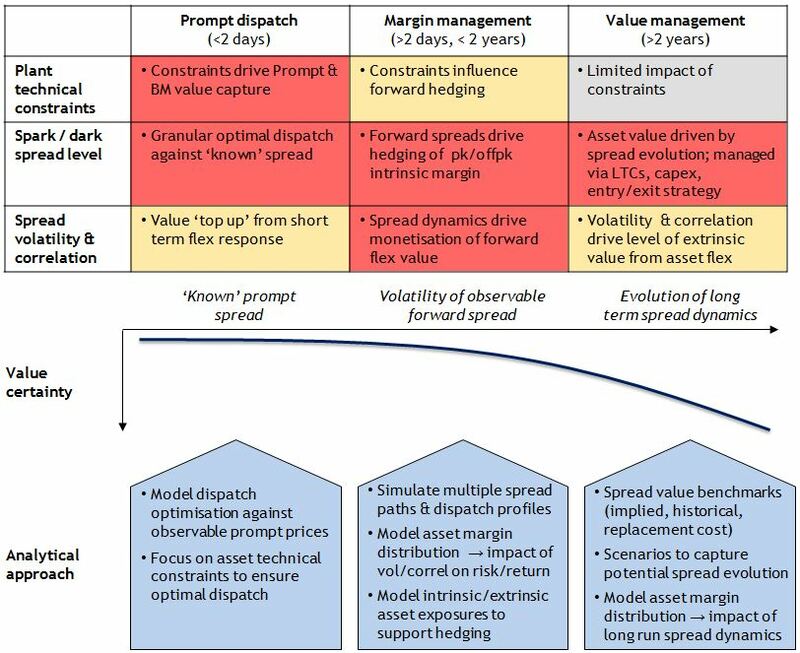 Spread levels: The structural market price conditions that drive ‘intrinsic’ plant margin as measured against projected future spark or dark spreads (i.e. the generation margin implied by the premium of power prices over the cost of fuel and carbon). Spread dynamics: The volatility and correlation of power, fuel & carbon prices that drive generation margin risk and the value of plant flexibility. Breaking the problem down by time horizons and value/risk drivers, allows a more targeted approach to plant analysis as illustrated in Diagram 1 below. The top table shows a ‘heat map’ of the drivers of value/risk over different time horizons. Analysis can be targeted accordingly as shown in the blue boxes below the table, which we explain in more detail in the following paragraph. Generation asset owners often split responsibility for managing power plant value based on time horizon. An asset portfolio or investment management team are typically responsible for managing plant value over the asset lifetime horizon. While responsibility for value management over the prompt/hedging horizon is usually handed to a trading function (either internally or via contract). This division of responsibilities is logical from an organisational perspective, but it is important that value is consistently measured and analysed across time horizons. It may be difficult to hedge plant value in 5 years time, given an absence of liquid forward contracts. But value over the lifetime horizon will eventually be monetised via hedging and dispatch optimisation decisions as the dispatch period approaches. A common flaw in the analysis of asset value over a lifetime horizon is to ignore the practical implications of how value will be monetised via hedging and optimisation decisions. While a consistent analytical approach is important across all value horizons, it makes sense to target the focus of analysis by time horizon as described below. Over the intra day to week ahead period ahead of dispatch, the focus of analysis is on plant optimisation to manage near term value and balancing risk. Plant technical constraints such as ramp rates are key. Value analysis is about understanding the interaction of these constraints with transparent and granular prompt forward and balancing prices. Understanding value uncertainty is less important than accurately capturing optimal dispatch decisions. It is typically plant scheduling and operational trading teams that are most interested in value over this short term horizon. A simulated distribution of plant margin can be used to inform value management decisions, e.g. understanding the value/risk impact of incremental hedging decisions. Analysis of value over this horizon is typically of interest to trading desks as they hedge asset exposures. But it is also important for asset managers in understanding how hedging decisions impact plant value and risk. Asset managers and investors are typically most focused on quantifying and managing power plant value over a lifetime horizon. Value uncertainty is significantly higher beyond the forward curve horizon. Asset values are subject to major shifts in factors such as gas vs coal pricing, capacity margin evolution and regulatory landscape. Anyone tempted to rely on price forecasts to analyse plant value should compare forecasts from 5 years ago with the reality of today. Targeting value analysis to recognise market uncertainty should be the key focus over an asset lifetime horizon. Forward curve simulation: understanding what an extension of current forward market pricing would mean for plant value. Scenario definition and simulation: projecting credible downside or recovery spread scenarios driven off required levels of asset remuneration (e.g. fixed cost recovery or life extension of marginal generation asset class), and then simulating potential margin distributions around these. Implied value: using price data from (i) recent power plant transactions or (ii) indicative tolling contract pricing quotes to ‘back out’ market implied generation asset value. Historical value: Analysing plant value capture over an historical horizon that captures different market conditions (this is an important way to benchmark the actual plant value that can be monetised versus theoretical modelled value). Replacement value: Understanding the level of spreads that are consistent with the market delivering incremental generation capacity. This is not just a simple analysis of new build cost (LRMC). Given policy supported growth in renewable capacity, replacement cost is now more focused on cheaper sources of incremental flexible capacity (e.g. plant life extensions or flexibility enhancements). All of these benchmarks can be translated into a view on the long run evolution of market spreads and generation margins. But it is important to overlay simulation based analysis to capture plant extrinsic value, particularly as renewable output continues to erode conventional plant load factors. In our view, a simulation based plant dispatch optimisation modelling approach is key to the consistent analysis of value across all three time horizons. The analytical approaches described above are about gaining a better understanding of the behaviour of plant value and risk given market uncertainty. Targeting analysis to the drivers of value & risk over different time horizons maximises the benefit of analysis to inform commercial decision making. This may be decisions to invest in (or divest) assets. Or it may be decisions on enhancing the value of an existing asset, e.g. investing to increase plant flexibility or understanding the maintenance/cost impact of changing operational patterns. Simple scenario analysis no longer does justice to understanding the value of conventional power assets. But by using targeted simulation based analysis and multiple value benchmarks, plant owners and investors are able to confront the impact of market uncertainty.